The Rosetta Stone German course went online. By means of the Rosetta Stone German Online Subscription you can learn German over the Internet simply with the use of your Web browser, a headset, and a tiny piece of language recognition software installed on your computer. The Rosetta Stone online language-learning solution teaches German with a method called dynamic immersion. It essentially means that you learn German in German, without translations – like you picked up your mother tongue. The online language-learning subscription is exactly equivalent to Rosetta Stone’s boxed course: three levels take you from the basics to intermediate skills by means of listening, speaking, reading as well as writing activities. Advantages of the online version include that it costs less and is ready for use right after your subscription, without delays for shipping and lengthy installations, and available 24/7. The subscription to the Rosetta Stone German online language-learning solution gives you access to three levels of German with four units each. Every unit has four lessons, and each lesson includes a core lesson, the main exercise, as well as a variety of activities which take between five and ten minutes to complete. With the exception of milestones, which take longer and conclude a lesson by practicing what you have learned in real-life scenarios, you can perhaps sit and do German activities while commuting by train or having a lunch break. The total duration of a lesson varies between about 80 minutes and 2 ½ hours – the milestone testing series not included. Therefore, the length of a Rosetta Stone online lesson might be compared to the time it takes to complete a grammar book’s chapter. Level 1 of the Rosetta Stone German online language-learning solution introduces German in a way which makes it easy for everyone to start learning. Topics include language basics, greetings and introductions, work and school plus shopping. In listening activities you absorb the sound of German, and you begin to speak right from scratch with speech recognition feedback showing syllables, words and phrases pronounced correctly. Speakers of similar languages have an advantage as the pronunciation exercise can be demanding at the beginning. Reading and writing activities make use of contextual formation by giving your cues to the correct answer in the images. At the end of level 1 you will be able to ask Wieviel kostet dieser Stuhl? (How much does this chair cost?) as an example. Level 2 of German builds on what you have learned in the first level, gradually increasing complexity of the phrases. Its four units, travel, past and future, friends and social life, dinning and vacation make slightly more use of the tenses in the conversational language style characteristic of the Rosetta Stone German online language-learning solution. The program helps retain your new language by a method called adaptive recall which triggers review activities depending on your performance; the better you do the longer it takes until a review comes up. The online program keeps track of your progress continuously. Therefore, you don’t have to be a genius and will naturally progress to Level 3 whilst enjoying the Rosetta Stone German online subscription . You will be able to understand and say Eines Tages möchte ich in einer berühmten Band singen (One day I would like to sing in a famous band). Level 3 advances your German skills in the four units home and health, life and world, everyday things, places and events so that you posses conversational skills at the intermediate level in a number of real-life situations. You can read and write accurately combinations of the words and phrases you have learned through interactive technology in many cycles of images – intuition – interactivity – instruction including, for instance, Möchtest Du mit mir am Freitag in ein französisches Restaurant gehen? (Would you like to go to a French restaurant with me on Friday?). The milestone number five in the fourth unit of level 3 features a couple going for a walk and meeting people as the final activity provided by the Rosetta Stone German online subscription. Please note that you can choose the course type which matches your language-learning goals. Reading, writing, speaking and listening is recommended and set by default. Alternatively, you can opt for subsets of activities or an extended version of the German course. For your chosen course type you can disable "Learn letters and sounds" to skip such activities if that makes sense to you. As a native speaker of German it strikes me how similar the Rosetta Stone German online language-learning solution syllable-pronunciation exercises work compared to the way my mother and my family taught me language. Moreover, with the exception of reading, the online German course builds fluency without formal grammar almost identically to the experiences in my early life. It is thus intended by the designer of the German course that among the first pictures you see there are girls and boys in activities you have done yourself when you were a child, like swinging in the garden or climbing over a fence. By these depictions and teaching you how to say Junge (boy), Mädchen (girl), Frau (woman) as well as Mann (man). The Rosetta Stone German Online Subscription tries to unlock you natural language learning capabilities by putting you back in the shoes of a child. However, cultural behavior is not taught in the Rosetta Stone German language-learning software, where the pictures do not typically reflect German speaking countries. Rather, places and objects are illustrated in a neutral context along with the people depicted being a blend of age, ethnic origin and cultures. On the other hand, I don’t think that the lack of cultural immersion matters so much if learners of German are open to the Rosetta Stone method, rather than focusing on the missing pieces which would make for perfect cultural immersion as well. This is an excellent means of learning common German without a particular vocabulary of typical dishes, or the German stereotype. In the Rosetta Stone German online language-learning solution you constantly interact with your virtual teacher. The interface provides screens where you have to select the missing image piece to match the text, and prompts where a meaning derived from an image must be associated with words, e.g. Was is das? (What is that?) Das ist der Arm eines Mädchens (This is the arm of a girl). A green check always means you have made the right selection whereas an orange X indicates that you were not concentrating, or got the answer wrong. Another type of exercise is syllable pronunciation, where you repeat after the speaker, and finally say the whole word; Bü-cher, Bücher (books). Speech analysis works similarly, where you listen to the perfect, native German speaker and then produce a word or sentence with the option to view your emphasis and pitch graphs . Then there is speech practice where you speak into the headset the correct expression, and speech production where you produce a new word or sentence from displayed clues. Writing activities include read-hear-type or hear-only exercises where you can make use of your own keyboard, or the interface’s mouse keyboard if that is more convenient. The Rosetta Stone online course contains multiple choice tasks, of course 🙂 as well as lessons where singular, plural, articles, masculine, feminine and neuter forms of German nouns are waiting for you. What you have learned through all courses, units and levels of the Rosetta Stone German online language-learning solution is at the most an equivalent to a year of language study in a class as a result of the total numbers hours taught, and the nature of the immersion method: The Rosetta Stone online course teaches language basics plus a number of everyday situations in German, and immersion, in general, can only be helpful in start learning a foreign language. Thus, the Rosetta Stone German online language-learning solution cannot probably replace traditional ways of learning vocabulary and grammar in the long run. However, the German online subscription is really useful for self-learning at your own pace such as for vacations, or accompanying other means of learning the German language for taking your degree of fluency further. The Rosetta Stone German online subscription with access to language levels 1, 2 and 3 is $199.95 for six months or $299.95 for one year, and you get a headset for free. Thus, if your computer meets the system requirements, and if you subscribe to the 6 month German online language-learning solution, you save 60 % compared to the price of Rosetta Stone’s German boxed CD-course bundle, including the audio companion worth $50, which sells for $549. Of course, you do not have the CDs and other materials to use once the subscription is up. If you are not a speedy learner, or do not think that you will be able to use your subscription several times a week, you may be better off getting the boxed version, because learning at your own rate can take place at a slower pace. If you do not have a facility for picking up languages quickly, you may also want the boxed version, as it would be a shame to have just started the 2nd level, and have your subscription expire. If you are a quick study, and disciplined in your approach to the lessons, the online subscription to Rosetta Stone may be ideal. 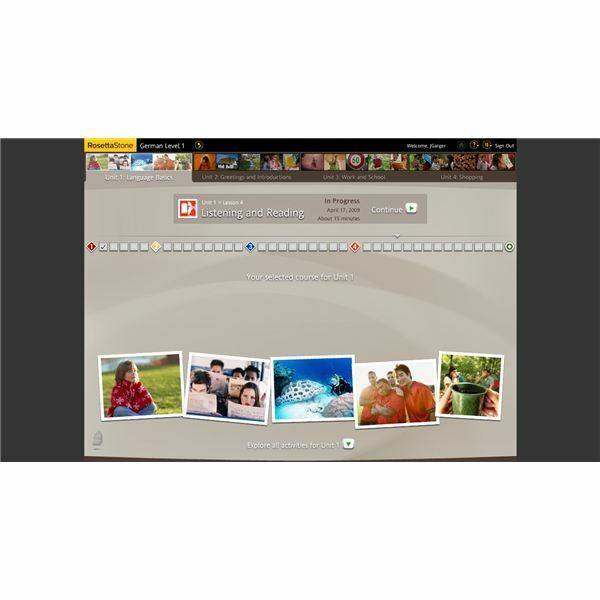 For an overview of the similarities and differences in the Rosetta Stone online program, and their boxed software, see the article :Rosetta Stone Online vs. Rosetta Stone installed.